Hollywood Boulevard intersects with Sunset Boulevard where the fun continues. Stop here for a look at the Tip Board offering up-to-the-minute wait times for all attractions.Then embark down the palm-filled street lined with sleek 1940s cars and a farmer’s market-style eatery. Lying in wait at the far end is the imminent and looming Twilight Zone Tower of Terror. 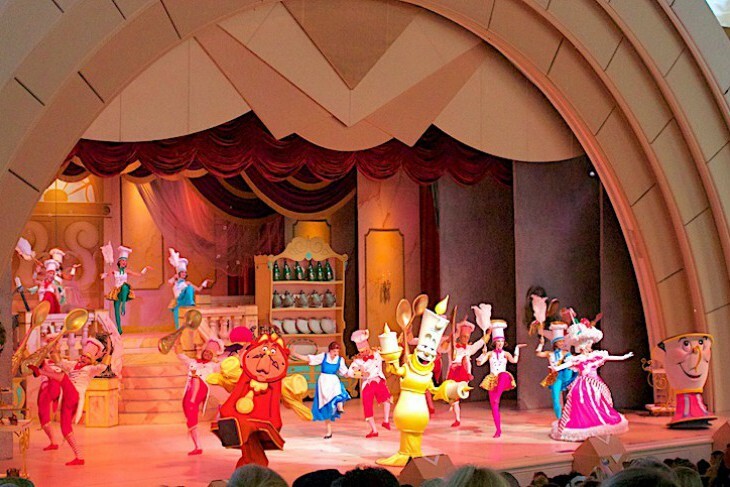 A Broadway caliber stage production featuring the characters and music of the blockbuster Disney movie "Beauty and the Beast". The chicken-hearted can take comfort in knowing that although there are three inversions on this ride there are no steep drops. If you chicken out, there’s an escape route immediately before entering the elevator; just ask a bellhop for directions. You’ve nabbed a special invitation to an Aerosmith concert, but it’s clear across town and you’re late! 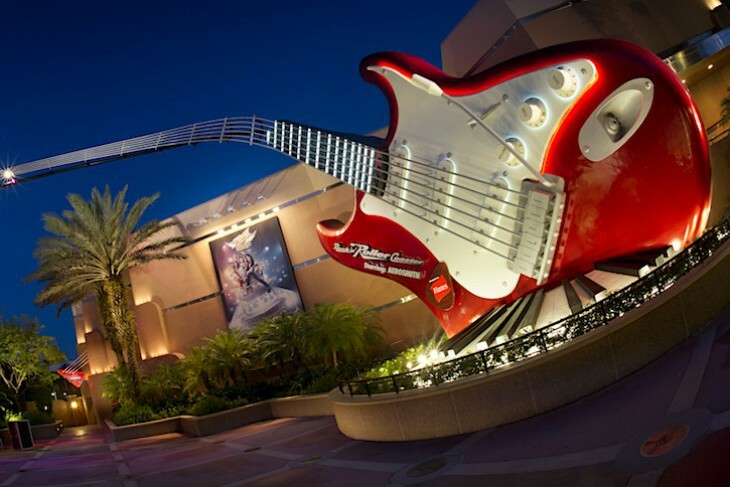 Disney’s wildest coaster ride takes place inside a twenty-four passenger “stretch limo” speeding down a Los Angeles freeway amid blasting Aerosmith music. Zooming past, through, and around neon Hollywood landmarks you’ll loop and corkscrew in the night. And that’s after you’ve accelerated to a speed of 60 mph in just under three seconds. Hold onto your hat (or anything else you might treasure) because this is pure Disney fun. 10-minute ride. Minimum height: 48 inches. Not recommended for expectant mothers, those with back, heart, or neck problems, or those prone to motion sickness. Cara's Tip: If you’d like to sit in the front seat just ask, but be prepared for a wait, because every other daredevil around has the same idea. The chicken-hearted can take comfort in knowing that although there are three inversions on the ride there are no steep drops. On this free-falling adventure you’ll certainly feel you’ve entered The Twilight Zone or at the very least a brand new dimension of fright. The waiting line snakes through the crumbling grounds of the deserted, 13-story Hollywood Tower Hotel with its rusty grillwork, dry cracking fountains, and overgrown and unkempt foliage before proceeding through the spooky, abandoned lobby of dusty concierge desks, forgotten luggage, and dead flower arrangements. Step into the gloomy hotel library for a message from Rod Serling (on a black-and-white television, of course) who relays the tale of a stormy night in 1939 when an elevator filled with people was struck by lightning and disappeared. 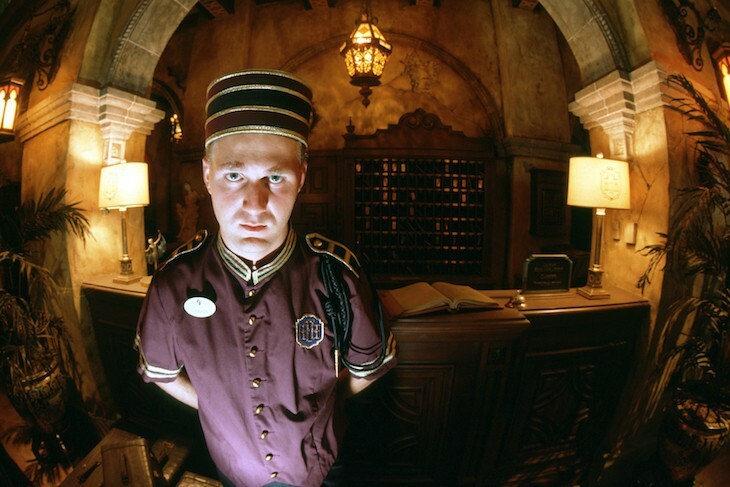 A bellhop then invites you into the boiler room where an old, rusty service elevator awaits you. It ascends and moves horizontally through several remarkable special effects and then, in the pitch black without warning, plummets 13 stories to the bottom. Up you go again, and down, and up, and down, between which you’ll have dazzling views of the park. If you can stand the thrill don’t miss this one; just be sure to ride it on an empty stomach. 10-minute ride. Minimum height: 40 inches. Not recommended for expectant mothers, those with back, heart, or neck problems, or those prone to motion sickness. Cara's Tip: If you chicken out, an escape route is located immediately before entering the elevator; just ask a bellhop for directions. Sorcerer Mickey’s fantasies soar to new heights in the 8,000-seat Hollywood Hills Amphitheater (with standing room for another 3,000). The Mouse himself orchestrates this extravaganza atop a 40-foot mountain on his lagoon-bound island. 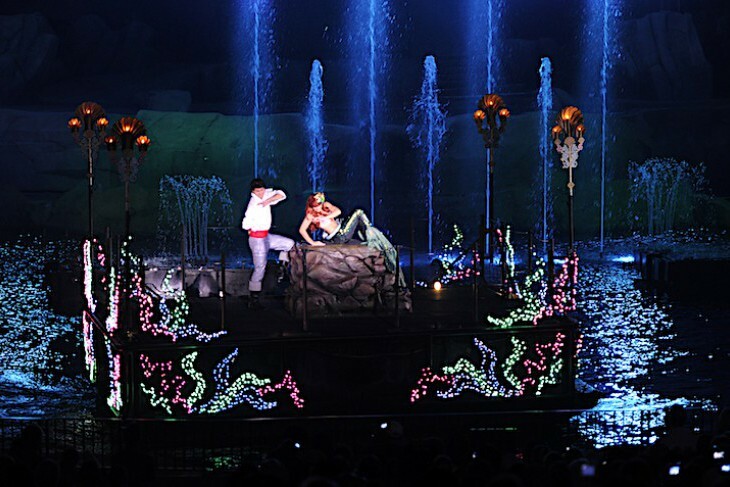 While Mickey struggles with the forces of good and evil in a series of lavish dreams and wild nightmares, guests thrill to the sight of walls of dancing water and wild, windy storms accompanied by stirring music, choreographed laser effects, and projecting flames. A favorite segment is the procession of floats representing the best of Disney happy endings, quickly followed by a bevy of Disney villains. Of course, Mickey wins out and, to the delight of the audience, a steamboat, captained by Steamboat Willie and stuffed with Disney characters, sails past in anticipation of the grand finale of water, lasers, and fireworks. Nightly performance. For guaranteed seating with less waiting book a Fantasmic! 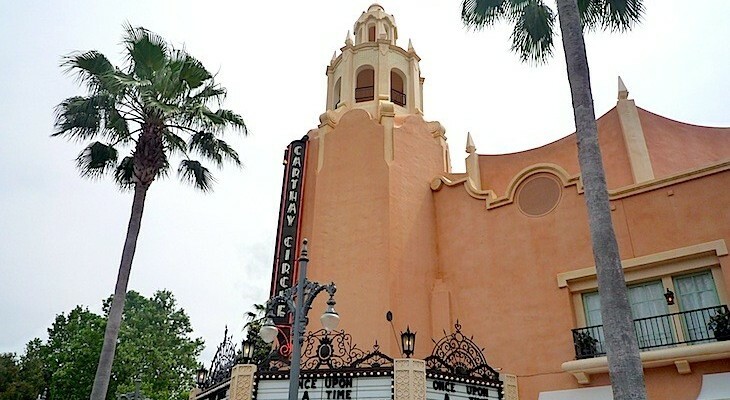 Dining Package for lunch or dinner at Hollywood Brown Derby, Mama Melrose’s, and Hollywood and Vine (dinner only). Reservations can be made as early as 180 days in advance by calling (407) WDW-DINE, or (407) 939-3463. After your meal you’ll receive a seat ticket in a special reserved area on the far right of the theater making it possible to arrive only thirty minutes prior to showtime. Reservations fill up quickly, so book as early as possible. Cara's Tip: I know it sounds tedious, but it’s necessary to arrive about 45 minutes to one hour prior to snare a seat. Once the theater is full you’re out of luck. If you wait until fifteen minutes prior you have a good chance of the left-over seats in the reserved FANTASMIC! Dining Package area or a standing-room-only spot whose only advantage is a quick dash out once the show is over. If you’d like to be among the first out of the theater take a seat in one of the back rows (really some of the better seats; the front rows can be a bit soggy). On windy or rainy nights the show is sometimes canceled.